Today I’ve been leafing through an old travel diary. I’ve always kept travel diaries. I’ve always thought that they are a great supplement to taking photos. A photo can capture a moment as much as a view, but a diary can evoke so much more. A travel diary fixes a point in time in a different way, it brings back more immediately our original thoughts and perceptions as we felt them back then, which can often surprise us especially when reading the diary again years later. Memory can play tricks in reflection. It’s strange to find how we remember things differently as time passes. Some things stick and some things get forgotten. It’s not always easy to sit down and write at the end of a long day, at least it isn’t for me. But if I do I never regret it. 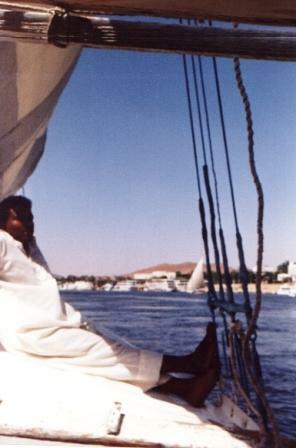 “Aswan. July 14th 1992. Today started early, before dawn. … Cairo Airport, flying down to Aswan and then on to Abu Simbel. The views of the Sahara stretching off into the endless distance were fantastic, like a different planet. 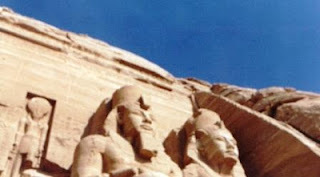 … We had a perfect view of the two temples of Rameses and Nefertari at Abu Simbel as the plane banked to land. Here we visited both temples and saw Lake Nasser, which is vast. The temples have been moved from their original locations in an enormous UNESCO rescue operation, effectively transporting two entire cliff faces in order to save the rock-cut temples from the flooding caused by the creation of the Aswan High Dam. Originally the temples’ huge facades were carved out of the natural hillside but in order to move them they were cut up into massive blocks and moved to higher ground. Close up you can see the joins where they’ve all been stuck back together like giant Lego bricks, and because of this they look quite strange. Standing in the shade of the entrance to the Great Temple of Rameses you can see the graffiti of various ages carved into the calves of the seated Pharaoh, including Ancient Greek (which really gives you an idea of just how old they are) on the lower left leg of the shattered figure. As we stood there listening to Nabil [our Guide] I thought of Giovanni Battista Belzoni digging down through the sand here to find this entrance. Apparently this Temple is aligned so that twice a year the rising sun enters directly down the central passage, similar to the Neolithic burial mound at New Grange in Ireland. Once we’d looked around inside each of the two temples we were lead back to the bus via a little door in the hillside. Passing through this door was like being Mr Ben, as we suddenly found ourselves climbing up a metal gantry from which we saw the huge modern concrete dome above the main temple, which is a truly remarkable sight. It’s fascinating to see and think of these as two feats of engineering – one ancient and the other modern – combined yet separated by thousands of years.